Melbourne for Dogs is the go-to book for new and existing dog owners in Melbourne wanting to know where and when they can take their dogs off-lead in Melborune’s hundreds of parks and beaches. It is available online and in bookstores, selected pet stores in the Melbourne metro area. You can also purchase it at the annual Melbourne Dogs Lovers Show, .at the Royal Exhibition Buildings in May each year. Published in association with the RSPCA and with a forward by the much-loved Dr Hugh Wirth, the usual retail price is $24.95. 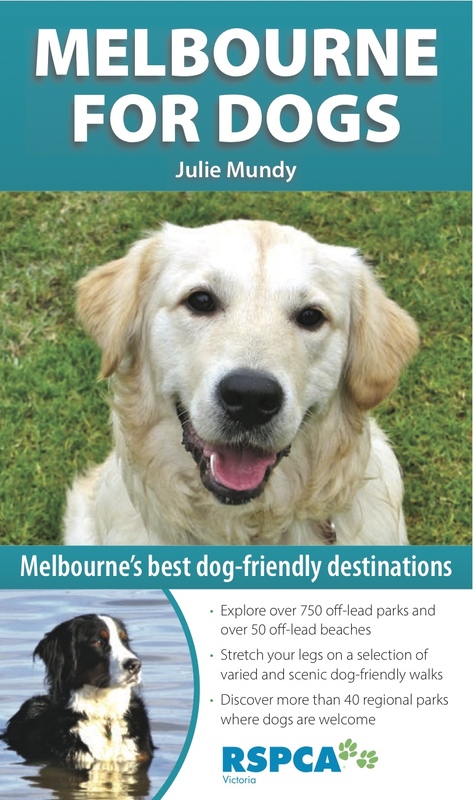 The book has details of over 700 off-lead parks and 50+ off lead beaches throughout the 31 Melbourne Metro councils, along with a series of longer walks and regional parks which are also dog friendly. Let us know what you think when you use it – Indie and I sure had a heap of fun researching and writing it – as you can tell when you play ‘Spot the Indie’ throughout the book! Hi Julie – keep us in the loop! We are a new pet sitting listing service called PetHomeStay, launching in Melbourne right now. We are focussing on off lead dog parks to find sitters and will be taking your recommendations along! I was wondering if you had your book published yet as I am looking for a guide book on the best dog walks/parks etc in Melbourne? Hi Alex – thanks for your email. I am glad you are looking for exactly what I am writing! But unfortunately I am still in the write up stage, which should be finished by April, then it will be a couple more months to go through the editing and publishing process, so I would have though August is realistic. No, I am sorry that there aren’t other books (which is why I am writing this one). I have written some articles about the best dog beaches, best off-leash areas and best bushwalking track to take your dogs on in Melbourne, on Weekend Notes, which will at least get you started. Try the link below to get you there, and you can then search under my name (Julie Mundy) to find the relevant articles. Otherwise, your best bet is to look under your local council website, as they almost all have lists of off leash areas in parks in their locality, though sometimes it can be a bit hard to find. Hope that helps in the meantime. Julie. Thanks for that Julie – are you able to email me some of things you have written? A friend of mine is moving to Melton and has two dogs and we are wanting to put something together for her? Hi Alex – thanks for your note. Unfortunately, I don’t have those 4 articles in emailable format, as they are uploaded directly onto the Weekend Notes website, but if you have a look at them there, you can print them off. In terms of Melton, unfortunately it’s not a very dog-friendly shire. Dogs must be on a lead at all times except in the 2 (yes, only 2) designated off-leash dog parks, which are at Navan Park in Melton West and Boronia Reserve in Hillside. I am sure if she gets out there though, the local dog owners will soon let her know where the best places are to exercise her dog. Hope that helps, J. Along the banks of the Yarra at Warrandyte is a short & sometimes busy but beautiful place to walk a pooch. Hi Julie, can’t wait for the book. Doggy Beach, Altona. It’s wonderful, my dogs Benny and Jack can hardly contain themselves when we go there and both have become great little swimmers, they are from Alice Springs so the sea was new to them! Rachael. Where would I be able to pick up a copy of your book? My dog LOVES to go on different walkies though I find myself spending ages looking for places she’s allowed to come on the internet before we can even think of leaving- i look forward to having the many places we can go ready and at my fingertips thanks to you! Hi Everyone, I would be interested in a copy of the book as I am trying to find somewhere in Epping (Vic) where my beloved boy and me can make new friends, If anyone knows of anywhere in or near Epping that we can go to make new friends, please let me know. Thanks. Hi Lynn – my Melbourne Dogs book won’t be out until mid-year, but taking your dog out for a walk in the local dog park is a great way to meet new people. If you have a look on the council website, they should have a listing of which parks are suitable for off-leash roaming, and guaranteed there will be a regular bunch of dog walkers there to welcome you. Good luck! Thanks Sue – that’s really helpful. I am spending a lot of time digging around council websites in collating the book. Some are very helpful and user friendly for dog owners, and some are absolutely not! We recently moved to Coburg and love taking our dogs to Shore Reserve (cnr Melville and Reynard). It is an off-leash park with plenty of space and a good group of regular dogs and owners that all seem to play well together. That’s a great recommendation Leonie – I’ll make sure to bring my dog and check it out for the book! J.
I am a dog minder in Melbourne and I specialise in confidence building for shy, anxious and under-socialised dogs. As well as minding dogs, I I take some (usually 3-4) on 1 day “Park Adventures” to places like Yarra Bend, Westgate Park, Cheltenham Park etc. where we have a picnic and go exploring. I also run 2-3 day “Dog Camps” in my camper van. We go to dog friendly camping areas like Rubicon State Forest, Mt Dissappointment, Howqua River etc. I’d love to talk to you about being included in, or contributing to your book (if it’s not too late!) or being involved in some other way. I am working on creating a website around what I do…when I can find the time. Hi Julie, in case your readers need tips on how to enjoy being out and about with their dog even more by having a reliable recall, and nice leash walking manners, let me know – happy to contribute. I’m a positive trainer and focus on real life dog training skills. My website has some tips on great parks and off leash beaches as well, in case you still need some more ideas: http://www.deltadogz.com.au. Looking forward to hearing from you. Hi Abigail – thanks for getting in touch. My book covers the Yarra Ranges (which includes some areas of the Yarra Valley) – when it comes out, but I don’t know of any other publications in the meantime, sorry. However, have a look at the Yarra Ranges Council website, which lists all the off-lead areas for dogs – there are not that many of them. http://www.yarraranges.vic.gov.au/Residents/Animals/Exercising_Your_Dog The Yarra Glen showgrounds (some of which is off-lead) is a lovely site to explore, and part of the Mt Evelyn Aqueduct Trail is off lead (observe the signs) but most of the longer walks in the region will be on lead – I loved the Emerald to Cockatoo walking trail, which does have an off lead area at the start and finish and goes through lovely forests, and the Warburton Trail is justifiably popular, but your dog needs to be kept on lead for this walk. You can also take your dog a bit north to Kurth Kilin State Park, including to camp. If I am taking Indie on a long on-lead walk, I try and give her a run around in an off-lead area first. Hope that help a little. My book should be out by Christmas, but hope you get some good walking in in the meantime. Thanks Julie, we explored the Warburton trail and was great, despite it being on leash. Looking forward to buying your book in time for our Xmas trip down there….any confirmed dates for the release? Hi Abigail – glad you enjoyed your walk – the weather is just perfect for it now! I am back to doing some walking around the Great Ocean Road for my next walks book. I just heard back from the publishers today about Melbourne for Dogs, that it won’t make it in time for Christmas, which is a real shame (boo-hoo! ), but should now be on the shelves in March/April – the editorial and design process is much longer than you’d expect, especially when cartography is involved. Sorry not to be able to make your Christmas list this year! J. We are a new business bringing food, wine and dog walks together in day trips to places such as Mornington and Bellarine Peninsula. Hi Kerry – what a fantastic idea – do let us know when you are up and running! J. Please let us know as soon as this book is out….. I would love a copy!! Yes, I remember! Thanks so much Janis – we’re just doing the design and layout at the moment, and it looks great, can’t wait for it to be ready, but it will be May – it will be launched at the Melb Dog Lovers Show. Hope to see you down the beach again before long. Take care, J.